Like gold? You can enjoy the feel of 87% pure gold (21 karat) with this estate bangle from the Middle East for the same price as 41% pure 10 karat gold. Higher karat gold is way more dense, has a richer colour, resists oxidation, cracking, chemical attack plus it just looks better. The majority of the world doesn’t even accept our domestic 10 karat and 14 karat as real gold because it is alloyed with so much silver. Did you know that when you’re buying 10 karat gold you’re actually buying more silver than actual gold. This simple elegant bangle bracelet is just 3.0mm wide but it measures close to 1.5mm thick giving it great strength. The coin edged pattern and diamond cut stripe running the entire circumference gives the bangle a long lasting protective finish that catches the light from every angle. At current gold prices ($1725.00 CAD pr oz.) 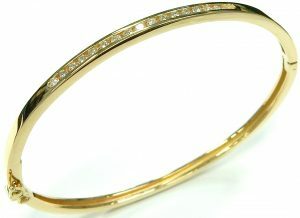 this bangle contains around $660.00 CAD in pure gold. When you can buy a finished piece of beautiful jewellery for just 50% more than its intrinsic material cost you’re getting amazing value. That’s what we’re all about at Bill Le Boeuf Jewellers; providing our customers with great value. Perfect condition, looking like new and estate priced at $990.00 CAD. Stock #e12065. 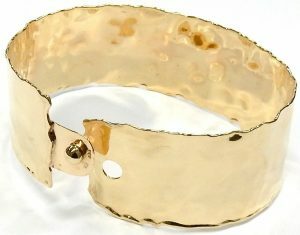 Looking like it just came off the runway at a Paris or Milan fashion show we present this hammered texture cuff bracelet. The simple gold sheet construction makes the most of golds natural qualities to make one of the most striking pieces of estate jewellery we currently have. The bracelet measures just over 1 inch in width and contains just under 1 ounce of 14 karat yellow gold (29.6 grams). The highly polished finish has a random hammered texture applied to the entire surface. No matter what direction it’s viewed from there are sections reflecting back at you like the shimmering surface of water in the sunshine. The tempered gold alloy along with the raised edges gives the bracelet a natural spring keeping it closed. Taking advantage of the natural 2 directions of spring tension is a simple yet effective hook clasp that seamlessly integrates into the design. It’s a great piece of jewellery we don’t expect to stay in our estate display for too long. Estate priced at $1,890.00 CAD. Stock #e12052. The cyclical nature of fashion trends is often a boon for the jewellery industry. Unlike updating your wardrobe where your old favorites get tossed or donated, jewellery is often just set aside if it falls out of fashion. Such was the case for this vintage 1940s bracelet judging from its like new condition. Gold tones and faceted geometry are back thanks to the surge of 1970s chic, making this 14.4mm wide statement bracelet on trend again! For practicality the 7 3/4 inch bracelet has been heavy gauge hollow constructed still weighing in at an impressive 26.5 grams in 14 karat yellow gold. Equipped with a sturdy box catch and additional safety lock the flashy bracelet is the perfect accessory to match those olive greens and burnt oranges that are all over the spring lines for fashion and home decor. Estate price $1,960.00 CAD (just $74.00 per gram). Stock #e11876. Life was so much simpler when gold “only” cost $500.00 dollars an ounce. Now that it’s well over 3 times that amount we likely will not see many bracelets made like this any more. This one is 75% pure gold and there is half an ounce in it’s construction. The bracelet is in like new condition with no worn areas. Weighing over 20 grams and measuring 7.25 inches long it would fit the average ladies wrist. Estate priced at $1,395.00. Stock #e6614. There is a surprising amount of spring tension engineered into this bracelet. 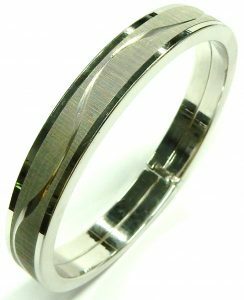 Unlike a bangle that has to fit over your hand resulting in a bit of a sloppy fit. This oval shaped bracelet opens over your arm then the strong spring hinge closes up for a much more comfortable fit. 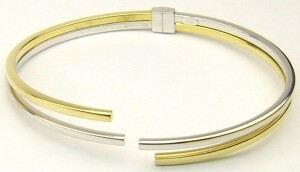 The open end forked yellow and white gold design is very modern looking. This piece is in very good condition. Just a few light scuffs are visible but showing no dents of any kind. If you wish we will provide a no charge refinishing and rhodium plating making it look brand new. Constructed from 5.6 grams of seamless square 2.0mm tubing make this 18 karat gold bracelet surprisingly durable. Worn consciously it will last a lifetime. Estate priced at $490.00 CAD. Stock #e9454. Lady’s bracelets are usually 7 inches long and men’s are made 9 inches long. That’s just how it is. Unfortunately not everyone has the same sized wrists. While 7 inches may fit the majority of ladies pretty well, it may not work for you. If you require a smaller size, it’s usually an easy task to remove a link or two. If you need a slightly larger size it can become a little more complicated. Quite often special order modifications on production jewellery is impossible, when the cost is quite a bit more and it can take a long time. If your wrist is slightly larger than average this bracelet should easily fit you. It’s just over 8 inches in length and is proportionately fitted with a conservatively estimated 3.75 carats of round brilliant cut diamonds. The 44 diamonds average SI2 to I1 clarity with a KL colour range. The bracelet is in like new condition showing no wear in the joints or any stretch; it could easily pass for never worn. Its quality can instantly be recognized from the second you pick it up. At 17.1 grams total weight this will never be confused with a super light 10 karat budget built example. If you love this bracelet and have a standard 7 inch or smaller wrist, our onsite goldsmiths can easily remove a few links for you. Comes complete with our Bill Le Boeuf Jewellers presentation gift box. Estate priced at $3,724.00 CAD. Stock #e10690. If this super modern take on the diamond bracelet isn’t a sign that yellow gold is back I don’t know what is. The trendy looking fun bracelet certainly is a fashion statement measuring almost 16mm wide. It wasn’t made to fashion standards however, weighing 14.9 grams and featuring 0.40 carats total weight of top quality VS-GH round brilliant cut diamonds, this 14 karat bracelet was made to last. Following the high quality theme the 7 1/2 inch long bracelet is equipped with a very heavy lobster clasp and strong end caps for longevity. Estate price $1,890.00 CAD. Stock #e9934. A unique array of natural gemstones is the answer to all of your colour needs! You could hardly ask for a more varied pallet. Thankfully the designer had a deep understanding of complementary colours. They used the softer tones of green quartz and amethyst to work up to the intense forest green tourmaline. The center piece is a vibrant pink tourmaline which instantly drops into the light pastel blue of aquamarine. Then the bracelet warms up into soft yellow citrine, finishing on inky blood red garnet. All on the backdrop of 18 karat rose gold the calmest of golds colours, blending into the skin tone and allowing the gems to hold center stage. The rich 18.8 gram bracelet is equipped with an ingeniously integrated box catch and extra safety lock. Despite the septuplet of gems being the star of this 6 3/4 inch long bracelet they’ve not been taken into account for pricing. We’ve valued it only as if it was a high quality bracelet containing no gems at all. They are something like a gift with purchase at the estate price of $1,610.00 CAD. Stock number E11938. 14kt. 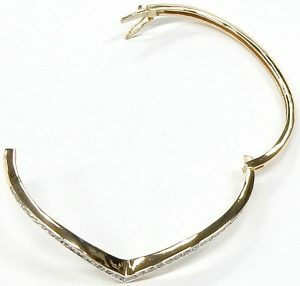 diamond chevron hinged bangle bracelet 0.90ct. tw I1-J 12gr. $1,610.00 CAD. Thanks to its antique S scroll style link and trend neutral chromy rhodium enhanced white gold this chunky bracelet is timeless. Looking equally appropriate worn alone, next to an over sized watch, or layered with other bracelets or a bangle. Not only was it designed to be ever-relevant it was built to last. The impressive 15.5 solid grams of 14 karat white gold means each link and connecting joint is of that coveted wear-it-and-forget-about-it quality. It’s even been finished with hefty end caps and a strong lobster clasp for added peace of mind. 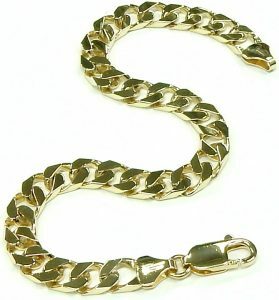 Measuring 7 1/4 inches long the like new bracelet boasts an estate price of only $1,050.00 CAD. Stock #e10496. Most diamond bracelets employ a large number of very small diamonds, aiming for a showy display encircling the entire wrist. These often end up rather dressy looking making them less versatile for daily wear. This unique diamond bracelet holds only 5 diamonds, impressive for their large size of 0.15 carat each. The I1-IJ quality round brilliant cut diamonds are lively and head turning for their unique size. Each has been securely set into a thick 14 karat yellow gold bezel adding to their footprint. The rest of the bracelet features a repeating pattern of elongated yellow gold links bracketed by narrow white gold accents. As a testament of high quality the bracelet weighs an impressive 17.7 grams. Secured with a strong white gold plunger clasp and additional safety lock the 0.75 carat total diamond weight bracelet is ready for daily wear. Estate price $2,100.00 CAD. Stock #e11882. 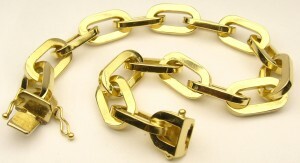 A heavy well crafted 18 karat yellow gold bracelet consisting of horse shoe shaped links that have evidence of previous rhodium plating that has been partially removed. It measures 8.5 inches long, weighs 46 grams and is secured by a heavy cast lobster catch. Estate priced at $2,800.00. Stock #e6067. Looking to break away from the Pandora style charm bracelet while taking advantage of the rising popularity of chunky yellow gold? This bracelet is your solution. Made from an impressive 22.2 grams of solid 14 karat yellow gold it’s more than substantial enough to carry all the charms you can throw at it. Each oval link measures 16.0mm long by 6.5mm wide and is made from 1.9mm thick solid gold wire. The bracelet measures just over 8 1/4 inches long. It could be worn on its own or with one or two simple charms for an Alex and Ani feel. 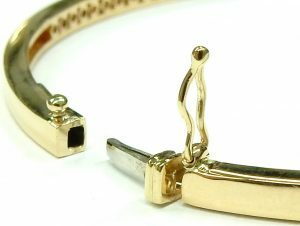 The real triumph of goldsmithing on this bracelet is it’s clasp; resembling the slide of a trombone it’s like nothing we’ve ever encountered and adds a touch of playfulness to the whole bracelet. Estate price $1,400.00 CAD. Stock #e11172. This is a bracelet you have to try on to understand the cleverness of its maker. The relatively simple intertwined link bracelet has built two looks into one by using white and yellow gold links. Fasten the bracelet with the catch facing left and rhodium plated white gold dominates with a strip of warm yellow running down its center. Fasten it with the catch facing right and warm yellow is the theme, subtly accented with a bright white center. The thoughtfully simple design is hollow in construction but still weighs an impressive 25.9 grams. 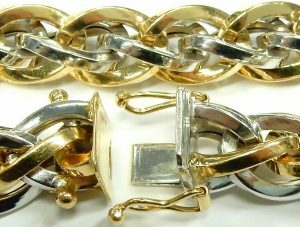 The 18 karat bracelet is secured by a super strong white and yellow gold plunger style clasp with two additional safety locks. The piece is in unworn condition, showing no dents or scratches along its 7 3/4 inch length. Estate price $1,980.00 CAD. Stock #e11039. Is this a bracelet first or a watch? We prefer to think of it as a bracelet that also tells time. From the house of Piaget Switzerland comes this solid 18 karat yellow gold Polo. Back in the 1980s the Piaget Polo was one of the hottest watches around. Thin was in and thin was a Piaget specialty; in the 1950s they produced a fully adjusted hand wind movement that measured only 2mm thick. The Polo design took the thin concept one step further when it was integrated into a flexible link bracelet. Our latest estate watch is our first Piaget to date and it’s a beauty. The original Polo was Piaget’s most popular model accounting for around 1/3 of their total sales. The case and bracelet seamlessly blend together in a graceful taper to the buckle. Even the dial has be treated to an alternating polished/brushed finish that perfectly matches the bracelet pattern. A standard setting crown vertically placed at 3:00 o’clock would ruin the aesthetics. Piaget’s proprietary quartz movement concealed the setting crown horizontally on the case back allowing a perfectly symmetrical balanced look. Included with the watch is a February 1986 appraisal in the name of the original owner. The appraisal describes the gents Piaget Polo watch style number 7131-c701 with an estimated replacement cost of $13,500.00 USD. This was a very expensive watch in its day. A brand new top of the line Chevrolet Camaro would have cost less than this watch did in 1986. Made exclusively from premium 18 karat yellow gold the watch weighs about the same as a Rolex Day Date but unlike the Rolex, Piaget bracelet links are completely solid. At 141.2 grams including the quartz movement the value of just the gold in this watch is around $5,700.00 CAD. For comparison, a brand new Italian made 18 karat gold bracelet of similar weight would be a great deal priced at $10,000.00. This watch could be worn by a man or woman, it measures 25mm wide and will fit a wrist size of up to 18.5cm. We have 8 never used extra link sections from a smaller Piaget Polo. The extra links allow the total potential length to over 21cm. These links can be used in the larger watch as they are only a couple of millimeters narrower. The extra links are being offered for only gold value but only with the purchase of the larger watch. The condition is almost like new. There is zero stretch or wear in any of the links. The finish appears original showing only some shallow scuffs and scratches. Including the original operating manual, 1986 appraisal and a complimentary 1 year Bill Le Boeuf Jewellers warranty this one owner Piaget classic is estate priced at $8,400.00 CAD. Stock #e11354. 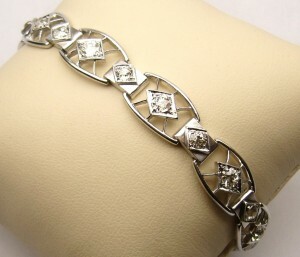 Diamond bracelets have always been popular estate items. In fact I wish we had more of them to offer but they don’t come in very often. So when one as pretty as this shows up it makes a welcome addition to our estate jewellery collection. The Art Deco design is very apparent with the geometric shapes found throughout. 17 old mine cut and European cut diamonds ranging in size from approximately 0.18 carats to over 0.30 carats are bead set along the entire length. With an average quality of SI2-I1-JK they sparkle with a unique combination of brilliance and dispersion only made possible by antique diamonds. Old mine cut and early European cut diamonds have very small table facets and tall crowns. This combination promotes the break up of light causing a more colourful display of sparkle when compared to a modern brilliant cut diamond. The 17.1 grams bracelet is of a standard 7 inch length. A tight fold over clasp with safety chain insure the bracelet will stay on your arm. A December 2001 appraisal is included with purchase that describes the hand made bracelet estimating a total diamond weight of 5.75 carats. Our opinion of total weight is a little more conservative at approximately 4.00 carats. Excellent condition showing no worn links or joints. Estate priced at $4,830.00 CAD. Stock #e8921. If you’ve ever attended a local First Nations Powwow you’ve probably heard the unique twinkling sound of Jingle Dresses. Said by the Ojibwe to have originated in Ontario. The dress and style is meant to celebrate the healing power and dignity of the Ojibwa woman. The sound of the dance is compared to raindrops and it’s hard not to understand the healing nature when you hear it preformed. If you’ve not had the pleasure (I’d make it a New Years Resolution if I were you), the tinny twinkle of this hollow woven bracelet is as close as a piece of jewellery can get to the ethereal sound. The well made 8 1/2 inch long statement bracelet measures an impressive 9mm wide. It’s been made from 18.2 grams of top quality 18 karak yellow gold and is secured with an over-sized spring ring catch and fixed ring end. 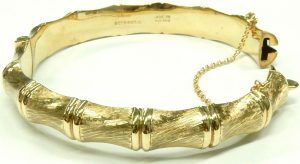 Estate price for the unique rope bracelet $1,344.00 CAD. Stock #e11862. Something very few people know about sapphires is they come in almost every colour of the spectrum. Within the rainbow of available colours they can show a great range of hue and tone. The conservatively estimated 9.5 carats of high clarity, very well matched natural blue sapphires are not your typical inky dark blue. These are more of a bright indigo colour; making the bracelet much more interesting and attractive. Alternating heart shaped links bracketed by 0.15 carats total weight of very high quality petite round brilliant cut diamonds results in a unique take on a coloured stone bracelet. Considering the high quality stones that decorate it, it’s really no surprise that the piece was made from rich 18 karat yellow gold weighing an impressive 18.2 grams in total. 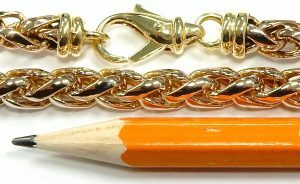 Measuring 7 1/2 inches long the bracelet is secured with a strong 10 karat lobster clasp and heavy ring ends. Estate price is just $3,500.00 CAD and represents excellent value. Stock #e10329. If this was worn or used before you sure can’t tell. Everything about this bracelet is perfect. All the bright cut decorative grooves still retain their crisp sharp edge, the original white rhodium plating is scratch free, and the micro-pebble finish twinkles like diamond dust. The 8.2mm wide hinged bangle weighs 10.3 grams and is formed from very strong seamless hollow oval tubing. A locking hinged clasp integrates with the pattern and virtually disappears. A clever safety system keeps the bracelet on your arm even if the locking clasp fails without the need for a folding side catch or awkward looking safety chain. This is a very modern piece in new condition. Estate priced at $420.00 CAD. Stock #e8509. There are times in jewellery where unique, thoughtful design is more eye catching than something diamond encrusted. This rectangular bangle is one of those instances. It draws in the eye with visual tension caused by 4 off set round brilliant cut diamonds. The rule of odds is a subjective principle of design that states groupings in odd numbers create a feel of balance, where even number groupings create competition and tension. Those tension causing 0.12 carats of I1-HI diamonds have been set into a rectangular channel to mirror the geometric bangle. The sturdy 8.7 grams of 10 karat Canadian gold that make up the 3.5mm wide piece are secured by a strong 18 karat white gold plunger style clasp with additional safety catch. Estate price $595.00 CAD. Stock #e10424. Simple and always in style. 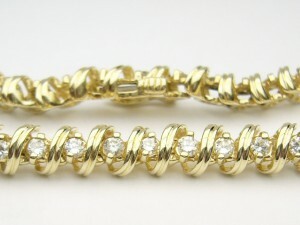 Straight line tennis bracelets have been popular for many decades. You can’t get much more traditional than a 4 claw yellow gold example. Measuring just over 7 inches in overall length the bracelet contains 52 round brilliant cut diamonds. Total diamond weight is estimated at 2.10 carats. The diamonds are an easy I1 with many SI clarity stones in the mix. A strong estimated colour grade of GH makes the quality much better than the average diamond bracelet. A few years of gentle use have given the links a smooth and supple feel. It’s as comfortable to wear as your favorite pair of slippers. A white gold plunger clasp costs a bit more to install but it makes a stronger more secure closure. The folding side safety catch is there for that extra level of reassurance. Finished weight is 8.7 grams in 14 karat yellow gold. Estate price $2,800.00. Stock #e9253. At any given time there are several custom projects going on at Bill Le Boeuf Jewellers. You’d think as Barrie’s oldest jeweller with the largest selection of jewellery and diamonds we’d have exactly what you’re looking for. But our clients still often want to add their own personal custom touch on an engagement ring or other jewellery item. Of the 1000s of custom pieces we’ve created over the years only a few bracelets come to mind. This high quality creation wasn’t originally made by Bill Le Boeuf Jewellers but it is one of those rare non ring custom made items. Even the integrated clasp has been custom made. Quality was certainly top of mind when this bracelet was crafted. Complete construction in only 18 karat yellow and white gold with significant sized round brilliant cut diamonds adding the sparkle. The 7 diamonds weigh a combined 1.20 carats and are of a conservatively graded SI clarity with an “I” colour. The 31 gram bracelet measures 7 inches in length that should fit the average ladies wrist perfectly. The bracelet is in like new condition showing no wear of any kind. The multiple joints and hinges haven’t even been broken in yet. Estate priced at $4,603.00 CAD. Stock #e11154. A nice example of high quality Italian craftsmanship. It looks pretty basic in design but just try to make something like this. It’s of heavy gauge hollow construction enabling the piece to weigh a reasonable 9.3 grams. Yet not heavy enough to put a lot of stress and wear on the 28 solid rivets. All the hinged joints are very smooth conforming to every wrist contour. Measuring 7.25 inches long it should fit the average ladies wrist perfectly. Two tone construction enables this bracelet to match many different jewellery items or watches. 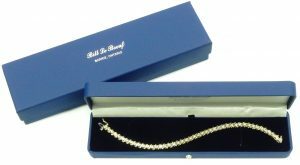 All estate bracelets and chain items offered for sale at Bill Le Boeuf Jewellers are in like new condition; stretched, worn, previously repaired or dented items are not tolerated. Items not meeting our high standards for condition are immediately recycled for precious metal recovery. This bracelet will see no such fate as it looks and feels like new. The high polished finish is easy to maintain and always in style. Estate priced at $609.00. Stock #e9414. 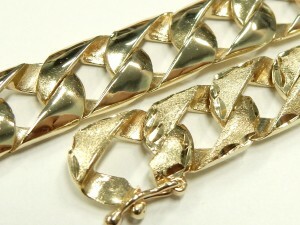 The best place to check for wear and tear on any necklace or bracelet is at the clasp. The sections where the two ends rub together are the most likely to show wear over years of continuous use. Jointed sections throughout can also show wear but often these areas are hidden from view. This 6.0mm Franco rope bracelet while of hollow construction still weighs in at a significant 12.8 grams and shows no wear of any kind. Manufactured in Italy from subtle rose gold with heavy duty yellow gold clasp sections. The key to making any jointed piece of jewellery last a lifetime is keeping it clean. Dirt and grime form an abrasive grit that gets between links and slowly cuts into them. Clean gold rubbing against itself has little impact on wear and tear. Keep your jewellery clean, it looks better and lasts longer. Bill Le Boeuf Jewellers ultrasonic machine is always on ready to give your jewellery a quick complimentary cleaning while you wait whether it’s from here or not. Even if you can’t see the dirt you’ll be surprised how much better your jewellery looks after a quick dunk in our cleaner. Our latest estate bracelet measures 7 1/2 long, it can be shortened slightly for the slender wrist in just a few days by one of our onsite goldsmiths. Perfect condition and estate priced at $770.00 CAD. Stock #e11724. By strict definition I suppose this is a watch but let’s face it, it’s really more of a diamond bracelet. Constructed from just shy of 13 grams (net weight) of 14 karat gold and covered with 40 nice little round single cut diamonds. From that description alone you’d think we’re talking about a tennis bracelet not a watch. Solar were an Eaton’s department store house brand that utilized high quality movements made by other manufacturers. 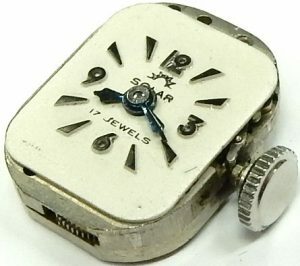 Eaton’s carried some pretty high end products; some of their watches contained movements made by Rolex. 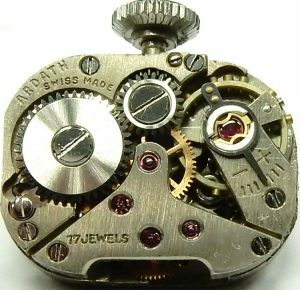 The hand wind movement in this watch is a more than capable 17 jewel incabloc shock protected mechanism made by Ardath Switzerland. It’s running well and keeping good time. The case and bracelet have been as skillfully manufactured as well as any fine piece of jewellery. In fact I’d say this watch is made better than most jewellery items. Think of all the individual components that had to be combined and hand adjusted in order to make everything work together. Each link is tightly hinged, the diamonds are expertly bead set, a beautifully hand engraved case back snugly fits the timepiece and snaps together with a precise interference friction fit. The locking buckle is double safety protected with an inner folding clasp plus a safety chain. A bit overkill perhaps, but better too much security than not enough. For a watch that is over 60 years of age the condition is excellent. There is no sag, slack or stretch in any of the links. The silver dial is close to perfect with only a few slight blemishes that go unnoticed except under extreme scrutiny. 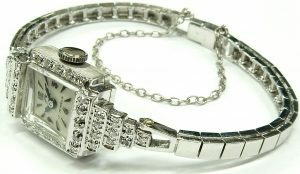 If you have a slender wrist and love jewellery why not try out this diamond bracelet that also tells time. 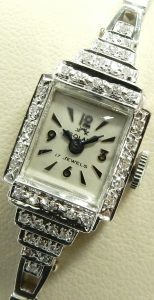 The vintage look is in and cocktail watches in this type of condition are seldom seen. Including a one year Bill Le Boeuf Jewellers warranty the watch is estate priced at $1,250.00 CAD. Stock #e11547. Italy is arguably the Mecca of the fashion world, home to innumerable fashion houses. Versace, Fendi, Valentino, Prada, Dolce & Gabbana, Armani, Gucci, household names that even the fashion illiterate know and respect. Canadian tastes are comparatively sheepish but I’m sure there is some brave fashionista in our audience who will appreciate this bold bracelet. True to Italian tastes the 25.3 gram bracelet is made from luxuriously warm 18 karat yellow gold. The bracelet expertly displays a sophisticated combination of colours and patterns. The custom cut gemstone beads play up the orange warmth of the gold and the blue green undertones of the acrylic leopard print. The domed links are engraved in patterns that pick up the essence of that leopard print, boiling it down to a shimmering impression. All together the high quality charms create head turning brilliance and chime softly during wear. 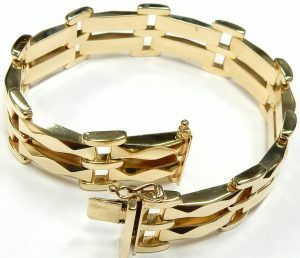 Estate price for this like new couture bracelet $2,100.00 CAD. Stock #e11038. The neutral colour of white diamonds looks great with virtually any coloured gem stone. Every imaginable colour can benefit from the brilliance and dispersions provided by nice quality diamonds. A dash of vibrant red does a great job at highlighting the overall brilliance of diamonds set into rhodium enhanced white gold. The colour is used as an accent, not over powering just enough to add interest through contrast. The extremely well made bracelet certainly deserves that extra attention grabbing pop of colour. 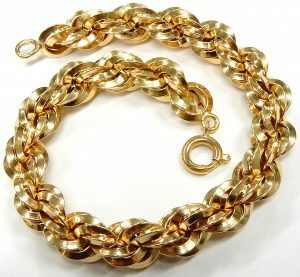 Made from 23.4 grams of 14 karat gold the 7 inch long by 7.8mm wide bracelet is in virtually unworn condition. The 1.25 carats of I1-J round brilliant cut diamonds twinkle between highly polished decorative bars. The striking red comes from 1.75 carats of round brilliant cut natural red rubies, surprisingly bright for their petite size. Secured with a sturdy plunger clasp and side safety catch. This tennis bracelet is equally suited for a night out or daily wear. Estate price $2,660.00 CAD. Stock #e10558. 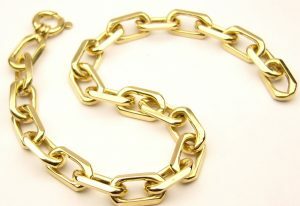 Italian made, 14 karat yellow gold, new condition, popular Gucci link design, 10 grams for just $600.00 Canadian. The math and the value are super easy to realize; $60.00 per gram for Italian made complicated, hinged and riveted links is very inexpensive. 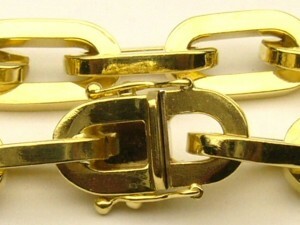 Even the clasp has been designed to look the puffed Gucci link. The bracelet measures exactly 7 inches long and should fit the average ladies wrist. Comes complete in our traditional Bill Le Boeuf blue and silver satin box, gift wrapped and ready to go. Perfect condition showing zero evidence of wear, there is no slack of any kind between the polished 10mm x 8.5mm links. Estate priced at $600.00 CAD. Stock #e9950. Talk about a whole lotta sparkle. 330 diamonds totalling an estimated 5 carats produce a dazzling display and a significant look when set into this 11mm wide 10 karat yellow gold and rhodium enhanced bracelet. The 20 gram bracelet is in like new condition showing no wear in any of the 22 flexible links. At 7 1/4 inches long it will fit the average ladies wrist. Although the diamonds are far from flawless at I2-JK they still exhibit abundant sparkle and twinkle. 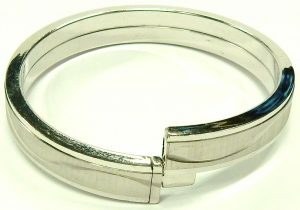 The bracelet is secured by an integrated white gold plunger clasp with side safety catch. At under $8.00 per diamond including the bracelet the value couldn’t be better. When you present this bracelet in our blue/white presentation gift box watch the fireworks begin. Estate priced at just $2625.00 CAD. Stock #e5973. Perfectly made Italian jewellery has to be the easiest thing to write about because there really is no substitute for quality and refined design. If you’d like a bracelet to last a lifetime, Italian made is what you want and this particular bracelet is worth trying on in person. Made from 16.7 grams of solid 18 karat yellow and white gold. Manufactured with heavy, over sized end caps and extra large stylized clasp the bracelet will hold up to almost anything. For style, it’s sleek and smooth, with a very subtle two tone look, a medium 5.55mm width that makes a statement without being overpowering. The like new condition bracelet measures a neutral 8 inches long making it appropriate for most wrists. Estate price $1393.00 CAD. Stock #e10353. Usually tennis have marginal quality diamonds at best and sometimes downright poor quality. Not this bracelet the diamonds used in this piece are VS clarity and GH colour. The 14 karat construction is of very good design and well made. The 40 diamonds are prong set and very secure. Total weight 16.5 grams and is secured by a white gold plunger catch with side safety. There is virtually no wear in any of the joints. Estate priced at $2760.00. Stock #e6241. The ultimate charm bracelet. Over 50 grams of solid 18 karat yellow gold. 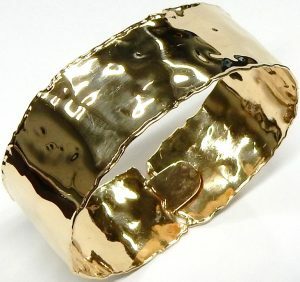 Not the light weight, hollow, diluted 10 karat gold typical of this type of bracelet. In the 1970s gold was only worth around $150.00 per ounce so manufacturers were not afraid to make high quality jewellery with lots of gold. 40 plus years ago this bracelet would have cost around $700.00. If you could find a new bracelet of this quality today I would expect to see a price tag of around $6000.00. All 18 of the square section oval links look like new aside from a little patina. There is no visible wear of any kind, the links do not have any thin sections. A white gold plunger type catch secures the heavy bracelet with a positive reassuring snap. Two additional side safety catches add an additional level of security. At 8 inches long it should fit almost any ladies wrist with some room to spare. Estate priced at $3234.00 CAD. Stock #e8630. Cartier inspired without the Cartier price point this hinged hollow bracelet is a timeless fashion statement. The 8 gram heavy hollow piece is made from calm 10 karat yellow gold and features a trio of bright I1-HI round brilliant cut diamonds. Protectively set into raised bezels with an estimated combined weight of 0.15 carats. The true genius of the bangle lies in it’s catch. Usually these bangles have an additional exterior safety lock, they are a necessity but unfortunately they don’t often work with the overall design. To keep the bangle looking sleek the Italian innovators created a double locking white gold plunger clasp with its own built in safety catch. Estate price $560.00 CAD. Stock #e11341. High quality bracelets are always popular estate items with our customers in both men’s and ladies styles. We tend to receive way more rings than any other type of jewellery. It’s refreshing to see a nice bracelet like this one show up from time to time. From the moment you pick it up the quality is easy to feel. At over 20 grams in 14 karat gold this is no light weight item that was built on a tight 10 karat budget. Each of the links is individually cast and secured by a heavy gauge solid pin. This bracelet was designed to last for a lifetime if regularly cleaned. If you don’t clean your flexible jointed jewellery items the dirt wears away the moving parts leading to prematurely worn joints and hinges. Most jewellers don’t charge to quickly clean your bracelets and necklaces. Take advantage of this service, your pieces will last much longer and look better too. This bracelet contains 22 round brilliant cut diamonds bead and bezel set in the centre fancy link sections. The I1-I quality diamonds offer a good sparkle from the estimated 0.41 carats of estimated total weight. At 7 1/2 inches in length the bracelet is a little longer than most. If you happen to have a smaller wrist, our onsite goldsmiths can adjust it accordingly. Excellent condition showing no wear in any links. Secured by a plunger type clasp with side safety catch for some extra security. Estate priced at $1610.00 CAD. Stock #e10750. A solid gold medical information bracelet is a great way to add some fashion to a potentially life saving function. To help draw important attention to the bracelet its caduceus has been debossed into the highly polished 1.2mm thick polished yellow gold plate. We could make it stand out even more boldly by painting the depressed area in red. The engraving plaque measures a generous 24.8mm x 12.2mm leaving plenty of room to record vital medical information. As a whole the bracelet measures a little over 7 inches and is secured with a large lobster clasp for easy fastening. Italian made by one of the world’s finest manufacturers, UnoAerre. The 5.7 gram bracelet is in excellent condition showing no worn links or joints. We can engrave up to around 5 lines of 15 letters in just a day or two. Estate price $280.00 CAD. Stock #e10364. Negative space in jewellery design is unfortunately rarely utilized but it can make all the difference; elevating a simple tennis bracelet to a striking and unique statement piece. Made from 9.8 grams of swirling 14 karat yellow gold the 7 1/2 inch long bracelet is sure to stand out nicely on any wrist. Set with 140 sparkling baguette and round brilliant cut diamonds backed by bright rhodium plating, the bracelet finishes off with an estimated total diamond weight of 1.00 carat. Estate price for this like new piece is $1295.00 CAD. Stock #e10230. A large portion of our estate blog speaks to faceted stones and their ability to bend and manipulate light in unique and mesmerizing ways. What we’ve not discussed is the interesting optical effects that gold can have when polished and expertly engraved. There is no better example of those effects than in this 24.1 gram 18 karat white gold bangle that displays three different patterns. Each equally striking; rolling, curling and breaking up the light to give the impression of constant whirling motion. The features are created by thousands of microscopically etched parallel groves. 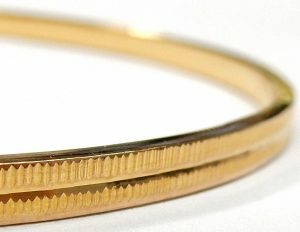 To really take in the effects of precision patterned gold and to truly appreciate the very high quality of this bangle you must see it in person. It’s secured by the best bangle closure we’ve encountered, under so much tension it has no real use for the button release box catch it’s been equipped with. You just may need a friend to help you get the bangle on. Measuring a stand alone 10mm wide by 3.85mm thick the hefty bangle is in next to new condition, retaining its bright rhodium finish. Estate price $2100.00 CAD. Stock #e10260. Chances are when you think of sapphires a dark blue stone comes to mind. While blue is the traditional colour of sapphire it literally can come in a rainbow of colours. All 57 of the square princess cut gems in this bracelet are natural sapphires. Trace amounts of elements cause the different colours. Chromium, titanium, iron, vanadium help change a normally colourless sapphire to pink, red, yellow, green etc. Each 3.0mm x 3.0mm perfect square has been cut in the same manor as a very well proportioned diamond. The result of the high quality cutting is a coloured stone bracelet than has better than average sparkle. The 14 karat white gold bracelet weighs 15.2 grams in total measuring 7 inches long. Two external side safety catches offer that extra level of security a bracelet of this quality deserves. The bracelet and sapphires are all in excellent condition showing no worn links or chipped stones. Estate priced at $4,340.00. Stock #e7864. We are no great analysts of Asian writing systems but by the powers of Google and a process of elimination we have boiled this bangle down to either Chinese or Japanese in origins (thanks to its hanzi of kanji trademarks). The fact that the bangle is 22 karat speaks to either as most Asian cultures don’t recognize gold of a purity lower than 18 karat at the very least. The skillful hand engraving that covers the bangles exterior in deep floral relief could be the motif of any nation as it is universally pleasing. 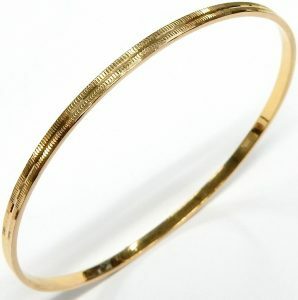 It is almost unfair to call this bangle hollow as the word doesn’t do justice to the heavy gauge of gold sheet that is responsible for the 36.5 gram heft. That weight is supported by a hidden hinge opening and integrated plunger clasp that locks securely into place. A small safety catch was added as an after thought for a bit of extra peace of mind. 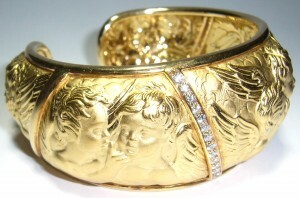 Estate price for this masterpiece bangle $2,880.00 CAD. Stock #e11935. If by some miracle you don’t know anything about Tiffany & Co. you’ll still recognize this Return to Tiffany Heart Tag Charm Bracelet. Considering its icon status the line started innocently enough as a key chain with a registration number and inscribed instructions to “Please Return to Tiffany & Co. New York”. If found the keys could be taken to the flagship store on Fifth Avenue and the owner contacted. Now it is the must have accessory for the label conscious available on Tiffany’s website for $420 CAD. 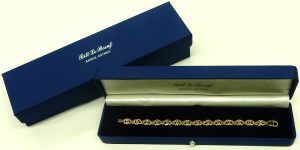 Our estate price for the 7.5 inch long bracelet with original box $252.00 CAD. Stock #e11930. 18kt. 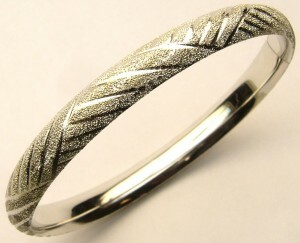 hand engraved vintage bracelet with diamonds 48gr. $3,900.00 CAD. This bracelet is a time capsule of the industrial revolution working its way into jewellery production. The hollow nature of the 173 honeycomb shaped octagonal links could not have been achieved without the aid of early mass production equipment. The engraved top of each link would have started out as a single thin sheet of gold. The engraver would have patterned the whole sheet at once. You can be sure it was done by hand from the inconsistencies later machine engraving would not produce. The sheet would then be placed under a punch or press and the individual links stamped out together in one blow. The buckle and belt end is where the skilled goldsmiths would do their work. The individual components would have been cast in large batches but it was up to the craft-person to make the delicate filigree and granulation. They would then be tasked with hand engraving the platinum accents and hand setting the 9 antique rose cut diamonds. The buckle clasp itself is a work of engineering, the bracelet end slides through the two part hinged buckle. Once you achieve the desired length you close the finger on the clasps bottom into a reciprocal hole on the underside of the bracelet. The decorative top of the buckle presses down to hold the finger in place and the two buckle parts are locked together with a catch on each side. For added security a safety chain with its own heavy spring ring catch was added sometime after the initial production. From an aesthetic standpoint the 21.3mm wide bracelet is equally outstanding! Made from 48 grams of 18 karat rose gold and bright white platinum the belt bracelet measures a wearable length between 6 to 7 1/2 inches. Estate price for this 1940s antique $3,900.00 CAD. Stock #e11936. Most Indian gold jewellery without gemstones is sold based on gram weight at set gram prices based on the time it took to create the piece. Convenient, as brides to be are usually showered in super premium 22 karat gold jewellery. The custom in most provinces is for family and friends to spend the days of the wedding filling her arms with bangles. With such high purity the gifts are meant to act like the cash given at Western weddings. When the need comes the bride and groom can sell off items for their cash value and use the money as most newly weds do. We loved the idea and these five patterned 18 karat yellow gold bangles are being sold by the gram; $63 per gram CAD to be exact! Weighing from 4.3 grams to 6.6 grams and measuring from 1.8mm wide to 2.9mm they can be purchased alone or in groups. Stock numbers E11885 through E11889. 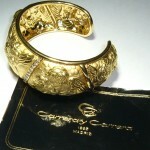 From one of Italy’s finest gold jewellery manufacturers UnoAerro comes this perfect condition hinged bangle bracelet. The 14 karat yellow gold bracelet is constructed from 10.8 grams of 6mm seamless hollow tubing that has been twisted and embossed with a negative diamond plate design. The clever pattern makes the bracelet much stronger and more resistant to dings and scratches compared to a plain polished tubular style. Unless it gets a major dent this bracelet will continue to look like new for as long as you own it. Sometimes bracelets can be difficult to put on by yourself since you only have one available hand to get the catch closed. The intelligently designed bangle has a spring loaded self centering closure along with a side safety clasp making it simple to put on. 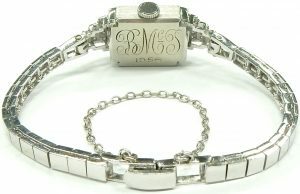 The bracelet is fully stamped with the factory trade marks plus the karat purity of 58.5% and BREV stamp, short for “brevetto”. This is the Italian term for license; the marking signifies that this particular design has been licensed or patented. The standard size should fit most ladies. As mentioned before this bracelet is in absolutely perfect condition showing no evidence of any use or wear. Yellow gold is back and this is a great example that really shows off the texture and beautiful colour of fine Italian gold. Estate priced at $735.00 CAD. Stock #e10835. You could not ask for a sturdier bracelet than the Return to Tiffany Narrow Circle Edge Cuff. Sure the name is a mouth-full but at 36.6 grams of solid sterling silver I think we can look past it. The iconic cuff should fit most wrists and is accompanied by all original robins egg blue packaging and Tiffany silver care card. Retired from the Return to Tiffany line the bangle is estate priced at $420.00 CAD. Stock #e11931. You couldn’t come close to replacing something like this new for only $420.00. The time involved to hand engrave the entire circumference alone would cost hundreds of dollars. Perfect condition and made from upgraded 14 karat yellow gold. 5.3mm wide with a weight of over 6.8 grams. Endless bangles are very popular and so is the vintage look, this bracelet has you covered in both categories. These can be stacked with others, mixed and matched as you like. Estate priced at just $420.00 CAD. Stock number e11641. I defy you to come in and have a look at these amazing pieces and not be impressed. Not only is Italy the home of the macaroni noodle, it’s also where this necklace and bracelet were crafted. Unusual inspiration for sure but amazing execution of design and manufacturing quality. The large articulated links are connected by sturdy joints that are practically invisible. Only traditional yellow gold can look and feel like this. 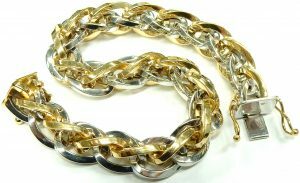 Alternating hand polished and Florentine textures are the central theme of the 18 1/2 inch necklace and 7 3/4 inch bracelet. High quality manufacture is a given, heavy gauge hollow construction keeps them durable but also more affordable. We figure these pieces were made around 25 years ago when gold was less than 1/3 of its current price. Importing something of this quality and design from Italy today would easily cost over $10,000.00 given current gold prices of $1630.00 per ounce (Canadian). Statement making and in like new condition. The two pieces weigh over 3.5 ounces, even with your eyes closed you can feel the quality. The necklace is available for the estate price of $4,550.00 and the bracelet for $1,785.00. If you purchase them together we will sell the set for $5,700.00. Stock #e11721 and e11722. This type of value can only be obtained through estate jewellery and no one does it better than us. Bill Le Boeuf Jewellers has unique experience buying and selling jewellery items since 1958. This bracelet has been expertly crafted from some high qualilty sapphires. Each of the 34 sapphires exhibit a rich navy blue colour; they’re not the typical overly saturated inky dark material normally encountered. They’ve been contrasted by 6 sections of bead set diamonds with bright rhodium plating adding some extra bling. The completely solid 18 karat yellow gold construction weighs a substantial 22.8 grams. The hinge is tight showing zero wear. A safe plunger clasp clicks shut with a reassuring snap, an additional fold over safety clasp adds another level of security. 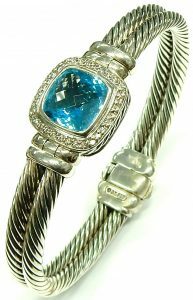 Great bracelets don’t show up that often in our estate section and this one offers truly amazing value. It likely will not last very long for the estate price of just $2,100.00 CAD. Stock #e11753. In some sense this is what jewellery is all about; a totally frivolous expression of style, luxury and fun. How can something like this not make you smile and feel good every time you wear it or someone else sees you wearing it. Everything in this fabulous bracelet is the real deal. Fully faceted and cabochon cut natural gems. Pink tourmaline, blue topaz, citrine quartz and peridot are randomly set throughout the creation along with 112 little diamonds in their own dedicated settings. We’ve estimated a total diamond weight of 1.00 carat and approximately 10 carats of coloured gems. A lot of time and effort has gone into assembling this as each and every one of the 157 stones was hand set. Weighing close to 1 ounce the feeling of quality is obvious from the moment you put it on. Crafted in upgraded 14 karat white gold that still retains its factory bright white rhodium finish. Excellent condition showing no wear in any of its multitude of hinged links. The white gold clasp snaps tightly closed and the two side safety catches offer a high degree of extra security. A circular diamond set charm adds a style feature that does absolutely nothing except look great. This bracelet is surely destined to become someone’s favorite jewellery item. 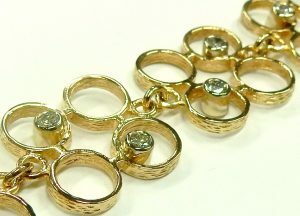 It measures 7 inches long, if you have a slightly large wrist we can add a few extra connecting rings.We love showcasing one of a kind estate items, it really makes our job fun and interesting. Only one and only available in downtown Barrie at Bill Le Boeuf Jewellers. We ship throughout North America and internationally too. If ever there was something you need to see in person, this is it. Estate priced at $3,500.00 CAD. Stock #e11778. There’s no substitute for traditional yellow gold. Unique in its qualities and abilities. It is extremely resistant to corrosion, amazingly ductile, the density alone leaves you with a feeling of quality and the rich colour is unlike any other metal. It’s no wonder humans have been attracted and fascinated with it for 5000 years. Diamonds too are completely distinct in the gem world. Renowned for their hardness, durability, brilliance and symbolism. Diamonds are completely different from any other jewel as they are the only gem composed from just a single element. Who could have imagined such a beautiful stone is made completely from just carbon. While diamonds look great in yellow gold, they’re even more spectacular in white gold. White gold allows high colour diamonds to really sparkle. Another characteristic of gold is its ability to be alloyed with other metals resulting in different hues. White gold is produced by adding various combinations of palladium or nickel, occasionally with smaller amounts of copper and zinc. This bracelet contains 52 good sized round brilliant cut diamonds each set in white gold, no simple rhodium plated settings here. It costs more to manufacture jewellery in yellow and white but the results are worth it. This 3.24 carat total diamond weight bracelet is assembled from around 70 different pieces all coming together in one of the nicest bracelets currently in stock. Even the clasp has been given extra attention to detail. The springy sections that keep it secure are made from white gold. White gold is harder than yellow and it has a better memory, making it more secure for clasps. In fact this bracelet has 3 clasps; a plunger clasp, a side safety and a fold over catch underneath. It’s the equivalent of wearing a belt and suspenders in case your pants suffer a wardrobe malfunction. This overachieving bracelet does it with a generous finished weight of 21 grams and the diamond quality is a conservative I1-H quality. Like new condition showing no wear in any of the 25 joints. Comes with an extra links enabling a comfortable fit of 7 1/4 inches in length. There’s a ton of value in this item for the estate price of only $3,300.00 CAD. Stock #e11220. I would imagine by now David Yurman and his line of distinct jewellery needs no introduction or explanation. 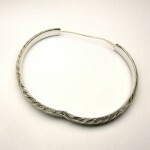 His twisted wire, bezel set, pave encrusted signature is all over this high quality sterling silver bangle. Not to mention of course his copy write and trademark. Weighing 43.6 grams the bangle is hinged on either side of the topaz and diamond focal point. The unique and secure locking clasp is intuitive and easy to use one handed. 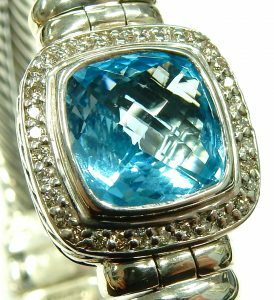 That cushion shaped 16.85 x 16.85mm center contains one extra brilliant checker cut natural blue topaz and 0.20 carats of round brilliant cut diamonds. 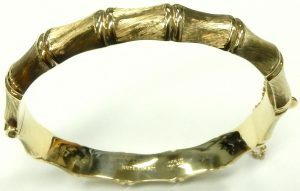 No longer a current model the bangle is comparable to others listed for a minimum of $1800.00 CAD. Our estate price $900.00 CAD Stock #e11533. 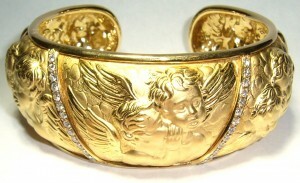 Nice design, perfect condition and crafted from 41.4 grams of 14 karat gold in Italy. The Italians have a long standing tradition of manufacturing some of the nicest gold jewellery around. The fit and finish of their products are best in the world. Most high end gold necklaces, bracelets and earrings can trace their origin to this part of the world. This necklace/bracelet combination has a soft satin finish on the oval yellow gold sections connected by smaller highly polished white gold square sections. This set is in perfect condition and has likely only been worn a couple times. The flexible joints are tight showing absolutely no gaps between links. 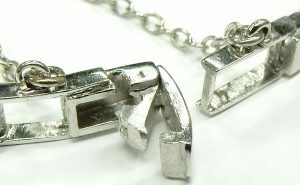 Both pieces are secured by white gold plunger types clasps with an additional side safety clasp. A white gold clasp offers more security than a yellow gold version due to white golds superior spring properties. This set is estate priced at $2,340.00 CAD. Stock #e7755. You just don’t see enough diamond bangles and here we are with a matched set of three! The diamond bangle offers all of the show stopping sparkle of a diamond tennis bracelet without the fuss. With no clasp to fight with and no delicate hinges to keep clean. These bangles are as close to wear-it-and-forget-about-it as you can get with a piece of diamond jewellery. Our tri-colour trio are individually prong set with a jaw dropping 322 I1-I2-I round brilliant cut diamonds. Together that’s 7.18 carats set into 29.6 grams of 18 karat rose, yellow, and white gold. Each measure 68mm diameter to accommodate most wrists and each is more than impressive enough to be worn on its own. As proof of their like new condition the white gold bangle maintains its untouched chromy white rhodium finish. Estate price for the three piece set $6,414.00 CAD. Stock numbers e11091, e11092, e11093. Subtle sophistication is the underlying theme of most Italian chain work and certainly for this necklace and bracelet set. The mixed link style uses elongated ovals for unity and three distinct patterns for interest. The doubled up patterned links roll into open birdcages during wear, giving the set volume. The 14.5 gram set is quite hollow and requires mindful wear, especially for the bracelet. To add longevity the bracelet can instead be discretely attached to the necklace for a total length of 26 inches. Made from high quality 18 karat yellow gold the versatile set will add warmth to any occasion. Estate price $900.00 CAD. Stock #e11041. Nothing gives us a greater sense of pride than showcasing incredible pieces of antique, vintage and estate jewellery at remarkable prices. There’s nothing more discouraging than the typical, mass produced, average quality jewellery you’re likely to encounter at an ordinary jewellery store. You know what I’m talking about; light gauge, low karat creations that are marketed specifically to the uninformed jewellery consumer. These products offer little value at any price and feature dull, drab diamonds that look more like specks of table salt. Finding exceptional value is pretty easy once you look at the components that go into the construction. This hinged bracelet was fabricated from almost 42 grams of high quality (75% purity), rich, traditional colour 18 karat yellow gold. The 332 small brilliant cut diamonds that total 2.72 carats in weight are of SI clarity, have a strong H colour and are all of very good cut. No question the basic components are top quality and the manufacture is equally impressive. Each little diamond has been tightly micro pave set by a proper 4 bead technique or half bezel/bead for the outer edges. This style ensures the diamonds stay put and have excellent resistance to wear and tear. The pilot hole that each stone sits in have been fully drilled through with perfect spacing. Esthetically attractive but also functional allowing the piece to easily be cleaned inside and out. The strong plunger clasp with side safety was made from white gold which has a better spring quality than yellow gold resulting in a more secure clasp. A heart shaped cut out on the receiving side adds a lovely secret finishing touch. To replace an item of this quality would easily run into five figures when considering the large amount of labour involved with manufacturing such an item. The bracelet is in absolutely perfect condition looking like new old stock. Just a simple cleaning was all it needed. The original pebbled satin finish with highly polished edges is 100% original. We never polished or refinished the bracelet in any way. High quality and a great price equals true value. Remember our favorite saying; “price is simply what you pay, value is what you get”, at Bill Le Boeuf Jewellers. Estate priced at $6,230.00 CAD. Stock #e10316. A collage of components, when put together mindfully can make an impactfull and luxurious statement. 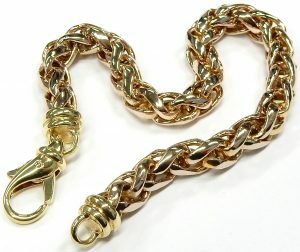 Over sized rolo links and ball end caps in warm yellow gold, accented by minutely sandblasted, brightly rhodium plated twisted wire sections. 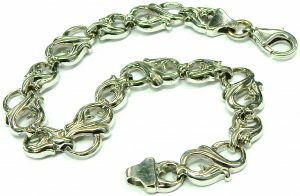 The bracelet is finished with a puffed heart charm, consigned to travel only one quarter of the bracelets length next to the jumbo toggle clasp. Reading it like a grocery list it sounds like it would look patched together. 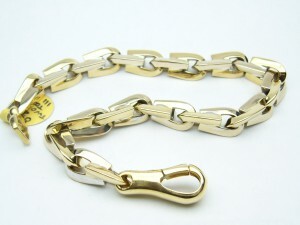 But looking at the pictures and especially in person the 15.8 gram 14 karat bracelet is sophisticated and eye-catching. Estate price $1050.00 CAD. Stock #e11266. Diamond tennis bracelets have become a staple of modern jewellery. Historically a jewellery accessory worn by the well heeled, they are now offered in countless styles with a range of prices to fit any budget. This 14 karat yellow and white gold tennis bracelet playfully mixes two motifs popular for diamond bracelets; the floral cluster and the infinity link. Both are set with sparkling I1-JK round brilliant and baguette cut diamonds. In fact there are 156 in total (we counted) for an impressive finished weight of 0.75 carats. 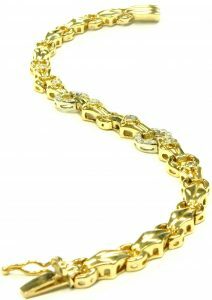 Add to that 11.7 grams of well made solid gold links showing no stretch or sag and you’ve got a beautiful piece of jewellery that will be the staple of your collection. The bracelet is equipped with a sturdy, integrated plunger clasp with an added side safety catch for peace of mind. All together the bracelet measures 7 1/2 inches long in like new condition, retaining its original rhodium plating over top of its white gold links. Estate price $1194.00 CAD. Stock #e9855. I’ll admit it, I’d never heard of Carrera y Carrera when this amazing piece of jewellery came in. I knew it was something very special because of the quality and quantity of material used in the construction. Manufacturing a cuff bangle bracelet using 26 effectively flawless round brilliant cut diamonds in a piece of jewellery that weighs 50 grams is going to be really really expensive. The details of shadow that the bracelet shows was accomplished by the best use of texture, finish and relief I’ve ever seen in this business. Designs like this are what Carrera y Carrera are known for. I discovered a long and storied history dating back to the 1800s while exploring the Spanish jewellery designer’s website. Jewellery produced by the esteemed firm is more like wearable art or jewellery sculpture. Ten little cherubs decorate the domed surface, each one has a different pose and position. It’s hard to capture the spirit of this item with only a few still photos. 26 top quality VVS-EF round diamonds are arranged in a chevron format on the front that are estimated to weigh 0.67 carats. You’re not likely to come across a higher quality or more exotic piece jewellery. Every once in a while we are fortunate to be able to offer an item like this. Overall condition is almost perfect. Original finish is in excellent condition, only a light ultrasonic cleaning was required to prepare it for sale. Natural green quartz, known as Prasiolite, is somewhat rare, especially in gem quality and oddly enough Thunder Bay Canada is one of those rare sources. Because of its rarity almost all green quartz on the market has been heated to change its colour. This kind of treatment has been around for a very long time but was first documented in the early 1600s. With its unique earthy olive tone the gemstone has found its way into statement jewellery for centuries. Our hand made sterling silver bracelet has been gifted with about 50 carats of the unique gem. The 38 gram 8 inch long piece feels almost David Yurman inspired with its oxidized twisted wire accents and head turning bulk. Estate price $228.00 CAD. Stock #e11264. Royal de Versailles is a Bloor Street staple. It’s a destination Torontonians and tourists flock to for high end jewellery and luxury watches. The renowned jewellery house combines top quality luxury with every day wearable fashion. Their playful heart bangle is a perfect example of that balanced approach. The flex bangle is made from 8.7 grams of brightly rhodium plated 18 karat white gold. Each of the three puffed hearts have been expertly pave set with 29 round brilliant cut diamonds. For additional sparkle four individually bezel set diamonds have been laid at odd intervals across the top half of the piece. All together the 91 SI1-GH very good quality round brilliant diamonds weigh an estimated 1.00 carat in total weight. The lighthearted bangle appears unworn and is accompanied by its original RDV red and gold box. Estate price $2030.00 CAD. Stock #e11247. Bangles are the type of jewellery usually exposed to a somewhat tough life. They are prone to getting banged around a lot (maybe that’s why they’re called bangles). Scratched and scuffed is usually how they show up around here as estate items. Sometimes they are dented and distorted and are only good for recycling. Imagine our surprise to get a completely unworn matched set! Bangles of this design with these intricately patterns are often pretty marred up from a lifetime of wear by the time we get them. The perfect condition set each measure 8.1mm wide and feature a micro grooved machine cut base texture with faceted edges and bright cut patterned centers. When worn the light plays beautifully across their complex surfaces, throwing flashes of warm light. The bangles are well made from a substantial 10.8 grams and 12.1 grams of hard 10 karat yellow gold, so they should stand up to the challenges of daily wear. Each has an interior diameter of 2.8 inches, perfect for the average to slightly larger wrist or hand. Estate prices $420.00 and $465.00 CAD. Stock numbers e11089 and e11090. If you’re looking on our website, chances are you like nice jewellery and chances are you like high quality jewellery too. The problem is, finding high quality, great value jewellery with a weak Canadian dollar and gold priced at over $1600.00 CAD per ounce can be a challenge. That’s where estate jewellery like this comes in. Just try to find a new comparable item for anything near this price; you can’t even get close. The 14 karat yellow and white gold bracelet weighs close to an ounce at 29 grams. It’s not just yellow gold with a simple wash of white rhodium plating around the diamonds. The entire top section where the diamonds are set has been made from a separate piece of white gold then soldered to the yellow gold base with an invisible seam. Bead set across the top are 27 good sized round brilliant cut diamonds of I1 clarity and “I” colour that total an estimated 1.18 carats in weight. Totally solid construction allows the 3.4mm wide bracelet to be worn every day without concern of denting a fragile hollow section. It’s secured by a plunger style clasp with an additional side safety that snugly locks everything down. Totally refinished and looking great the bracelet is estate priced at $1710.00 CAD. Stock #10784. Statement chains are few and far between, especially so when they come accompanied by a matching bulky bracelet. The fashionable set adds interest to the already striking kings link design with the contrast of brightly rhodium plated white gold oval links. That two tone pattern gives the eye somewhere to rest and appreciate the intricate details of the complex patterns. Both the bracelet and necklace are secured with high quality, specially made spring ring clasps with decorative end caps. 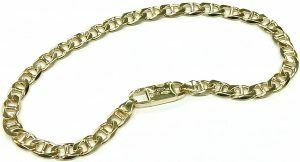 The bracelet measures 7 1/2 inches long and the chain measures 18 inches. For some added length the two can be fastened together for a statement making 25 1/2 inches. Considering its hollow nature the heavy gauge 50.3 gram 14 karat set is in great shape, showing next to no wear. Estate price as a set only $2048.00 CAD. Stock #e10294. The very best thing about silver as a medium is that it is so inexpensive. Artisan jewellers can go as big and creative as they want without the finished product becoming out of reach for most clients. If this 52 gram sterling silver statement piece had been made from 10 karat gold, the cost of the gold content alone would have been close to $1200.00. This doesn’t take into account the hours upon hours of labor required to make a one of a kind bracelet like this. Each of the 5 hand textured oval links measure a head turning 33mm long by 23mm wide. The high polished connector links and clasp add visual interest to the bracelet with their contrasting finishes. Estate price $140.00 CAD. Stock #e10678. A curb link bracelet is one of the most popular styles around. We always have them in stock, both new and estate. The flat oval curb link design is a favorite choice for both men and women. This 14 karat white gold example is unusual in several regards. White gold is a little less common than traditional yellow and the upgraded 14 karat Italian gold is a nice thing to see. The most striking characteristic of course is the fabulous bright cut finish that has been applied to both sides of the 6.0mm bracelet. Each of the tightly placed flat angular depressions act like miniature mirrors reflecting light and twinkling. The effect almost makes you think there are hundreds of tiny diamonds set throughout the 8 inch long bracelet. Manufactured with full and completely solid links the piece weighs a significant 13.3 grams. Secured by a sturdy and easy to use lobster clasp. At just over 8 inches in length the bracelet should fit most women. Makes a great everyday jewellery item with lots of bling that you don’t need to worry about. It’s a wear it and forget it item. Excellent condition showing little wear. The clasp and flat ends are showing scratches but this can easily be polished and rhodium plated to look like new. Estate priced at $605.00 CAD. Stock #e10776. Before electroforming was invented hollow statement making chains were die cut from thin sheet. The die cutting could also be set up to create three dimensional forms for added strength and visual interest. Some links, like the ones on this set, were made butterflied and during assembly folded in half linking one onto the next like a daisy chain. That chain making process, developed during the industrial revolution, created chains without a weak point. Being solder free and of a consistent metal thickness all areas of the chain are equally strong and resilient. 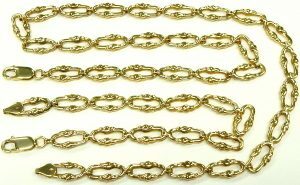 This early form of hollow chain production still required a relatively thick starting material so it’s not surprising that this “hollow” chain and bracelet set still weigh in at 28.6 grams of warm yellow 18 karat gold. The decorative links that make up the 19 inch long necklace and 7 3/4 inch long bracelet are in great shape thanks to their manufacturing. Both pieces are equipped with sturdy end caps and large, easy to fasten lobster clasps. Estate price for the set only $1480.00 CAD. Stock #e10295. Hand made, looking like it was crafted sometime in the 1960s this bracelet was way ahead of its time. It could be a key component of a modern jewellery collection and definitely something you’ll likely not encounter again. 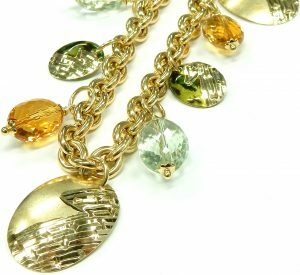 The high polished 18 karat yellow gold links nicely reflect light into the 11 natural forest green tourmalines, brightening them up and really bringing them to life. Although we didn’t remove each stone to weigh individually, by mathematical formula we conservatively estimate the total gem weight at over 8 carats. This yellow and deep green colour combination is pretty rare and needs to be seen in person for full impact. The 14.4 gram bracelet comes equipped with a handmade box catch and additional safety catch for added security. Estate price $1500.00 CAD. Stock #e9494. If vintage had a defining look in a piece of jewellery this tiled bracelet could well be it. The mosaic that stretches the 20mm wide monumental piece carries multiple levels of intricate detail. The 244 links are engraved with six complementing finishes. Patterned among the majority of yellow gold links are contrasting solid rose and white gold links, no simple coloured rhodium and plated sections here. The work instantly feels antique though the techniques used are post industrial revolution. Still not surprising to find the seven and a half inch bracelet was made by those Italian masters of gold. As is their way the piece consists of an impressive 61.5 grams of rich premium quality 18 karat gold. The mid 20th century bracelet comes well secured with an extra strong white gold box catch and two safety locks. Time capsule condition. To our knowledge it has never been polished or refinished in any way. These are rarely encountered in any condition let along practically unworn and exhibiting zero stretch. Showing only a hint of genuine patina it is estate priced at $4900.00 CAD. Stock # e11016. That this bangle should have been made in Hawaii is extremely fitting. The lighter tone lilac of the 7.80 carats of natural tanzanites certainly evoke images of large tropical blooms growing along a lush beach front. The vibrant gems are bracketed by pairs of I2-K round brilliant cut diamonds, adding a subtle sparkle to the piece. Together the diamonds add an estimated 1.00 carat total weight. No surprise these ingredients should be held in a sturdy 20.5 gram 14 karat yellow gold bangle. The well made piece is thoughtfully equipped with a white gold box catch for extra spring and durability. For that final touch of security the clasp has been backed up with a strong side safety catch. The bangle is proudly stamped MADE IN USA and is accompanied by a certificate of authenticity with an estimated insurance replacement value of $4350.20 USD back in 2006 when gold was trading at just $600.00 CAD. We feel an appropriate replacement value today with gold levels at over $1600.00 CAD is closer to $6000.00 Canadian. The bracelet is estate priced at $4200.00 CAD. Stock #e10945. There is almost exactly 1/2 a troy ounce of 14 karat white gold in this 7 inch tennis bracelet. 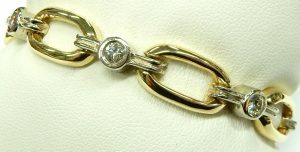 If you had to replace just the bracelet without any diamonds it would cost you around $1500.00. Each one of the 50 diamonds measure just under 3mm diameter and are estimated to weigh 1/10th of a carat. The diamonds are not perfect but they sparkle and twinkle pretty well with a reasonable J colour and I2 clarity. Considering they cost less than $80.00 each including the bracelet illustrates the great value this estate item has. No extra decorative gold, no illusion settings making tiny diamonds look bigger. Just a solid string of good sized bling. Sometimes this is what jewellery is all about; letting the natural beauty of precious gems do their thing. It’s also very hard for an item without any specific style to go out of style. The bracelet is in excellent condition showing almost no wear and tear. Engineered in a clever way so it will not roll down your wrist, the diamonds will always be facing the right direction. Hinged joints are in great shape as is the spring loaded tongue catch with side safety. No one would ever suspect this is a previously enjoyed item and you can feel good knowing you’ve “upcycled” a great piece of jewellery. The approximately $2000.00 in savings this bracelet has compared to new one of similar quality feels pretty good too. Estate priced at $3920.00. Stock #e9067. Many jewellery houses have shown bamboo bangles over the years but few are as thoughtful as this Birks piece. Made in England the piece carries the quality you’d expect from the Brits. Though hollow the bangle was made from a sturdy 14.9 grams of extra tough 9 karat yellow gold. The hinged bangle has been equipped with a super secure integrated box catch and safety chain. What really makes this 10mm wide bangle stand out is its hand applied radial texture, rolling the light across the bamboo sections to accentuate their unique curves. Accompanied by a mint condition Birks box. Estate priced at $840.00 CAD. Stock #e10917. Sure you “love” that dyed macaroni bracelet your kid made you. You wore it a couple of times, chipped some noodles and tucked it away to “keep it safe”. If you’re looking for a noodle bracelet that’s a bit more durable you’ll actually love this Italian piece. 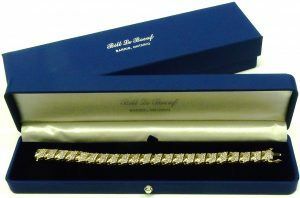 Measuring 7 inches long the articulated bracelet features heavy gauge hollow macaroni shaped links in alternating diamond brush and high polished finishes. The tightly packed links end up looking surprisingly elegant when worn and feel equally so weighing in at 17.4 grams. The bracelet appears to be in unworn condition showing no dents, dings, sag or stretch. Comes equipped with a sturdy box catch and side safety lock for extra security during wear. Estate price $1120.00 Canadian. Stock #e10923. Got Valentine’s Day covered yet? Maybe you do but I bet your man doesn’t. Help the poor guy out this year and discreetly let him know about this Links of London Sweetie charm bracelet in sterling silver. The bracelet weighs in at a substantial 52.5 grams. It’s brand new, never worn and comes with its original packaging and travel pouch. The only catch is the size. Although it’s made with a stretchy rubber cord to fit over your hand it is the small size. It will comfortably fit a lady with a slender wrist only. If you’re that lady don’t wait too long to drop that hint. These seldom come in and don’t last long when they do. The pretty little red puffed heart charm makes the perfect finishing touch for gift presentation on February 14th. The iconic Sweetie bracelet can be seen on the Links of London website where it sells for $325.00 USD (including the heart charm). Ours is estate priced at $240.00 CAD. Stock #e11074. What we often see with tennis bracelets is compromise. The tennis bracelet is one of the most time consuming and expensive pieces of jewellery to make. So manufacturers will find any way possible to shave off gold weight, diamond size or quality, and assembly costs. This 18.4 gram brightly rhodium plated 14 karat white gold bracelet however is the exact contradiction to that rule. Each heavy, well made link has been joined to its neighbor with a heavy 4 section rivet with capped ends to protect the hinge pin from dirt. This is important as dirt acts as a cutting agent and over years will wear every single joint of your tennis bracelet away to nothing, until it is worn beyond repair. These joints have been built strong and enclosed from the start and with regular cleaning will last a lifetime. Of course the really impressive feature of this bracelet is the 63 I1-JK quality round brilliant cut diamonds that come together to make 2.5 carats. They’ve each been set into heavy, protective partial bezels that are much more secure than the traditional prong style. The 7 inch long bracelet is secured with a hidden plunger clasp and heavy safety catch. Estate price $3290.00 CAD. Stock #e9852. Styles and trends come and go but classic efficient design is timeless. 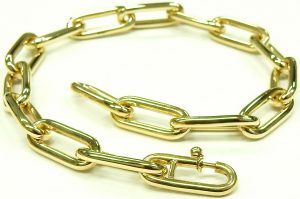 Whether a chain to secure your boat anchor to or a high end Italian 18 karat gold necklace, the basic formula to make a strong effective chain pretty much looks just like this. While this example was made hollow to keep the costs affordable, don’t assume it isn’t well made. Each of the 32 heavy gauge hollow links measure 9.2mm x 6.1mm (about the size of a Tic Tac) and are all invisibly soldered shut making it very strong. 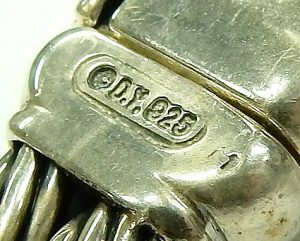 The bracelet is showing almost no wear except two small dents in a couple of the links. If we didn’t point them out you’d never even know they were there. While not too heavy you can still feel the quality by running the smooth highly polished links through your fingers. 7 1/2 inches long and weighing 9.3 grams the bracelet is secured by an oversized spring ring clasp. Estate priced at $715.00 CAD. Stock #e10833. Cable link bracelets are inherently strong enough to achieve that coveted wear it and forget about it quality. The triangular profile links in this example are made from solid 1.2mm diameter wire, allowing it to be sturdy without too much bulk. The high polished, warm 9.7 grams of 18 karat gold are well suited for the layered look that’s been so popular the last couple of years. Measuring the ladies length of 7 inches long it should fit the average feminine wrist. Secured by a strong lobster clasp the bracelet will look lovely worn next to a watch, bangle, or all on its own. Estate price $770.00 CAD. Stock #e10108. 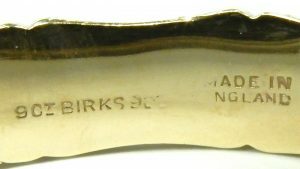 Back in the day, prim and proper companies like BIRKS almost exclusively manufactured and sourced all of their fine quality jewellery in the commonwealth. Their isn’t much made in 9 karat gold any longer in Canada but many years ago it was the legally recognized standard for items made from gold throughout every Commonwealth country. Even to this day 9 karat is the entry level gold standard for content in Canada, although most Canadian jewellery is alloyed to 10 karat or better. 9 karat gold is typically a soft pinkish yellow colour due to larger portion of copper alloy. Copper produces its unique hue giving the name rose or pink gold, it also has the benefit of making the item a bit harder. The bamboo motif and general style is difficult to date for this item but our best guess would be sometime in the 1960s. The condition is excellent; the hollow construction is scratch and dent free. It likely wasn’t worn very often as the hinged joint is still very stiff. Secured by a push button release plunger clasp plus safety chain will ensure it stays safe on your wrist. The bracelet weighs 7.3 grams and is of average overall size. Estate priced at $420.00 CAD. Stock #e10714. In Asian culture the bangle carries an immense amount of symbolism, different to each country and each region within those countries. Gold bangles are particularly important in Indian culture, used traditionally in wedding and maternity ceremonies and for modern Indian women, as a must have accessory. The type of bangle and use of that bangle in the wedding ceremony differs wildly from province to province, but is most commonly meant to symbolize good fortune, a happy marriage, and the protection of husbands and sons. In certain maternity ceremonies the mother to be will wear many gold bangles to help distract evil spirits from her child and herself and focus them on the tinkling chimes on her wrist. The use of bangles in Western culture is unfortunately purely decorative. This four piece set certainly fulfills the decorative aspect, with each bangle featuring a completely different pattern all of which play with light to a different effect. Worn together the musical set makes for some eye catching adornment. All together they are made from 15.6 grams of durable 10 karat yellow gold. Estate price for the set only $700.00 CAD. Stock #e10297. The history of XO coming to represent hugs and kisses is long and full of speculation. After much research it seems to be something that came about in the very late 1800s to early 1900s though the history of each symbol dates back to the Romans. These early emoticons of sort have graced countless letters and love notes and eventually transitioned into jewellery as all symbols of love do. The X & O is a natural choice for a bracelet as their shapes are well matched to fit into each other. This particular 7 1/2 inch long bracelet takes the X & O theme a bit further, creating its Xs of two interwoven bands. The high quality Italian made bracelet consists of 9.9 grams of 14 karat yellow gold in alternating high polished and brushed finishes. The 11.6mm wide bracelet is secured by an integrated box catch with additional safety catch. Estate price $630.00 CAD. Stock #e10410. In 1969 Tiffany & Co. released a line of register key rings inscribed “Please Return to Tiffany & Co. New York”. The idea was simple, lose your keys, you’ll find them at Tiffanys and it was quickly adopted by the stores all over the US. Re released as a throwback to that novel key ring the Return to Tiffanys line quickly became yet another Tiffany jewellery must have. The Return to Tiffany Heart Tag Charm Bracelet is the most iconic of that line. 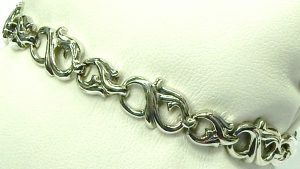 This 35.9 gram sterling silver 7 1/2 inch long bracelet is currently listed on Tiffany’s website for $420.00. Our estate version with blue box and travel pouch is estate priced for $240.00 CAD. Stock #e10724. No jeweler has their designs copied more consistently than Tiffanys. In some cases it is worth their time to pursue, like the lawsuit they just won against Costco, but in cases like their sterling silver bead bracelet there are just too many knockoffs to chase down. Try as the copy cats might there is no competing with that little blue box. The 8 inch long, 10mm bead bracelet is a jewellery icon that immediately reads Tiffany & Co. even though the proof of origins lies on a tiny 6.5mm tag. The stock 7.5 inch version is currently available on Tiffany’s website for $375.00 CAD our estate version, with box and travel pouch, is only $225.00 CAD. Stock #e10725. Imagine if shoes were only sold in two sizes, one size for ladies and one size for men. I’m sure there would be a lot of us walking around barefoot. Unfortunately that’s exactly the case with most bracelets, 7 inches long for women and 8 1/2 to 9 inches long for men. It can be a very frustrating experience for anyone without ‘stock size’ wrists who find themselves needing to buy an additional bracelet just to use for spare links. Or worse, if there is no extra bracelet available, paying to custom make a couple of extra links. This 14 karat yellow gold Figaro link bracelet understands your struggles and is accompanied with two extra links, one short and one long. A quick solder and the bracelet can go from 7 1/2 inches to 8 1/4 inches long, or anywhere in between. Equipped with heavy end caps and a strong lobster clasp for added durability. The 10.9 gram yellow gold bracelet is freshly polished and ready to go. Shortening the existing length is also easily done by one of our onsite goldsmiths in just a day or two. Estate price $600.00 CAD. Stock #e9982. A traditional and popular jewellery item has always been the diamond tennis bracelet. Most tennis bracelets are made up from “promotional” quality diamonds. Usually the diamond quality is I2 clarity, JK or lower colour, poorly cut and light weight settings. This bracelet however does not fit that description. The 46 round brilliant cut diamonds are of SI2 to I1 clarity, G colour and very well cut. The 11.4 gram yellow gold setting is in great shape with no wear or stretch in the joints. The bracelet measures 6.5 inches long and is secured by a white gold hidden clasp with a side safety catch. Estate priced at $3000.00 CAD (that’s only $65.00 per diamond). Stock #e6488. 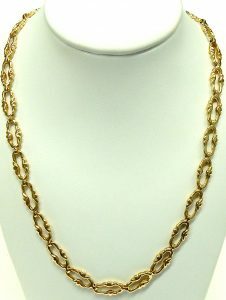 Beautiful example of the art of chain making. No body does it like the Italians when it comes to chain and bracelet making. The 14 karat yellow and white gold bracelet is made from hollow oval links with alternating polished and brushed finishes, connected by white gold figure 8 wire links. Measuring 8.25 inches long and secured by a large flat lobster catch. the bracelet weighs 18.2 grams and is estate priced at $1,150.00 CAD. Stock #e7135. This is the bracelet to convert all the people out there who think rubies aren’t for them. The 9.62 carats of high quality oval faceted rubies are some of the clearest we’ve seen and the colour will mesmerize you in person. At arms length the rubies flash every shade of red from a deep pure red to a light magenta. On closer inspection they almost glow violet under their table facets, but that light disappears completely when draped across the wrist. These pictures really do not do this item the justice it deserves. You need to see this one in person. 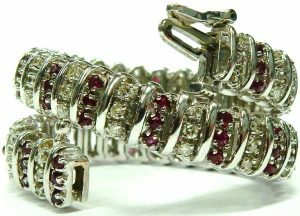 The rubies are separated and enhanced by 1.45 carats of bright white round brilliant cut diamonds all set in over 11 grams of 18 karat white gold. The extremely well made bracelet will be the highlight of any outfit and is secured by a tight box catch with two safety locks. Estate price $8820.00 CAD. Stock #e10171. Nice to see a tennis bracelet that was made with high quality components. So often we see tennis bracelets made from the lowest karat gold, super light weight construction and diamonds that hardly sparkle because of the low quality selected to keep the price down. There is an old saying that says “you’ll never regret buying quality”. New or estate that saying is true. This bracelet is all about quality. The substantial 13.2 gram 18 karat white gold construction and 20 high quality SI1-GH brilliant cut diamonds set this tennis bracelet apart from most. The 2.00 carats of bezel set diamonds look great contrasting with the highly polished domed oval links. The bracelet is in great shaped showing almost no wear of any kind. We will treat this bracelet to a fresh rhodium plating if the new owner wishes at no charge. The bracelet is estate priced at $3360.00 CAD. Stock #e7496.